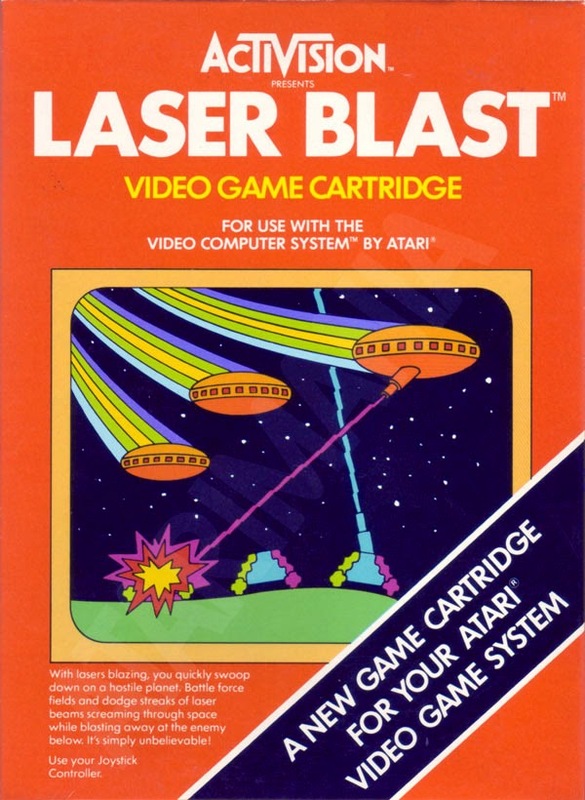 I was very surprised with Laser Blast as I tend to think of Activision games of that era, to be some of the best, but this one is bad, really bad. Even more surprising, it was designed by David Crane, himself, unbelievable. I have to remember this the next time I see him in a convention. I managed to get the patch score (100 000 pts) on my second try, the first try was just to lean the commands, and there is not much to learn. 3 enemies, half of the time they sit idle, you shoot them, next screen (aka next 3 enemies). The other half of the times, one of them tries to shoot at you, either you are lucky (80% of the time) and you shoot first, or you are not and you lose a ship. Done, end of the game. Since it is very generous in giving extra lives (every 1000 points, aka 3 screens), you quickly max out (6 lives), and you browse to the patch score without any problem, the only challenge is to stay awake. 90 points per enemy, 270 points per screen, 371 screens to get to 100 000, or 1112 enemies. Probably 30-45 minutes. I can safely say that little Billy who is excited in the commercial is a loser and was always picked up last at recess. 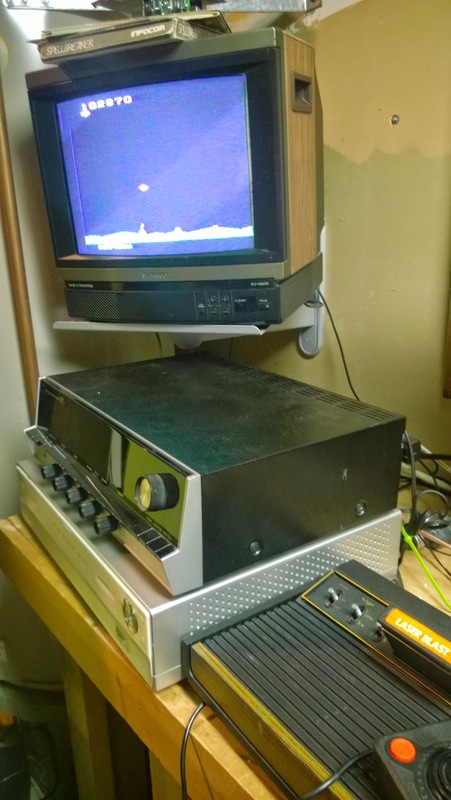 That game is an interesting discovery, for the ones who thought that the 1983 crash was caused by poor games from fly by night companies, well, the greatest of them all also produced crap. I hope the next game is going to be much better. 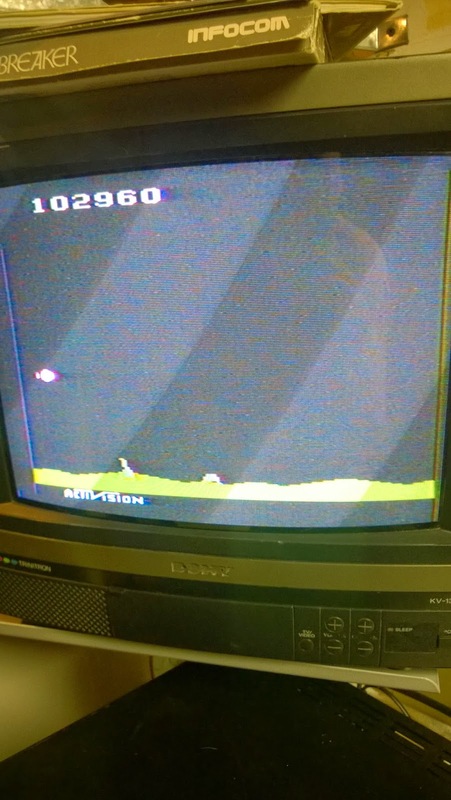 I think I might try the Activision Decathlon challenge, I remember playing this one to death, I might be able to do it. The one fun thing is that if you really have 5 hours of boring time you can hit the million, apparently the score shows 1!!!!!!! 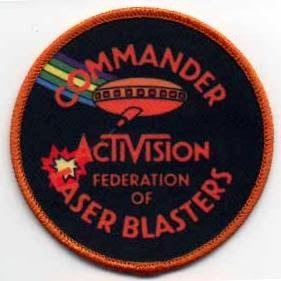 and you get a special badge. Without me, I was picked up first.